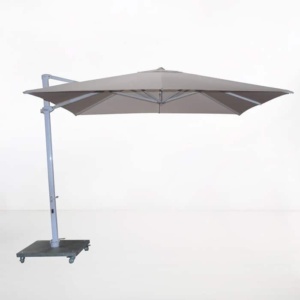 This 3.0 metre square cantilever umbrella has a 360 rotational movement in the horizontal position, as well as a tilting option. 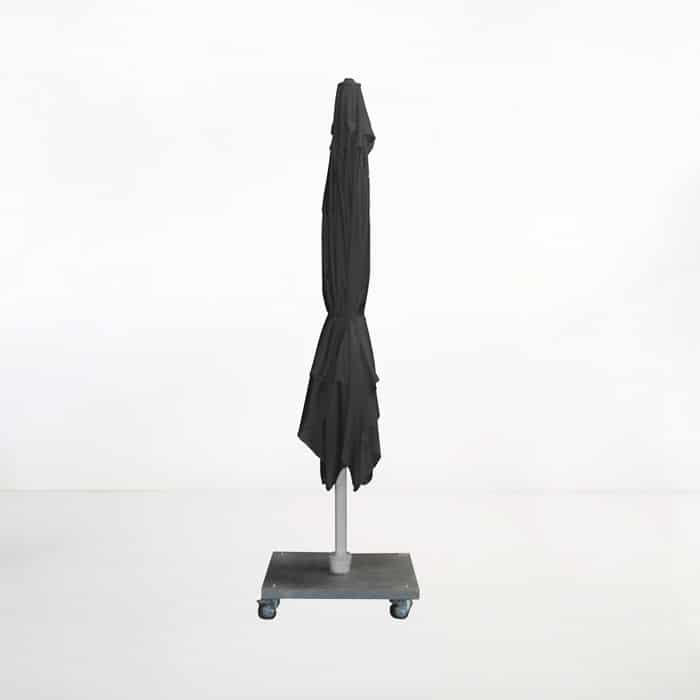 The canopy is made of black Sunbrella® fabric. Curate a space where you can unwind, take a break and retreat into a place of opulence and luxury… make it a space where you are safe from the harsh sun, and able to bask in true relaxation. 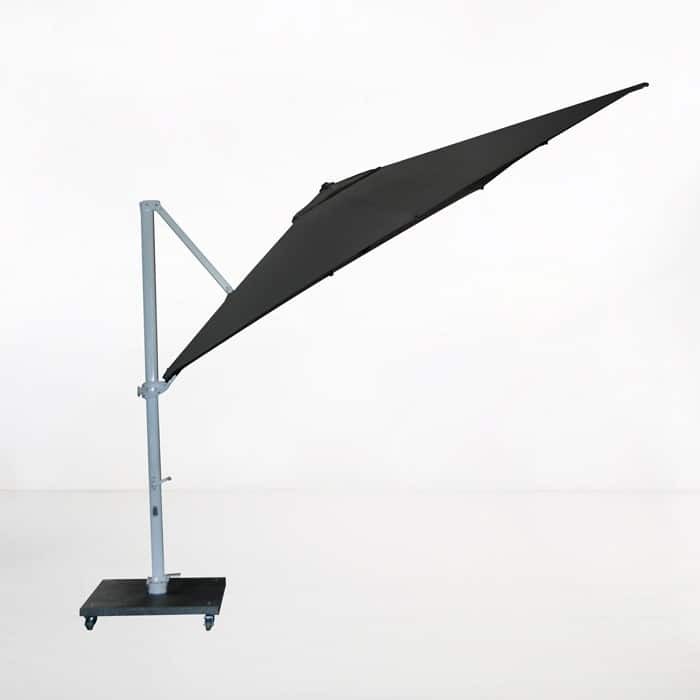 Do this with the Antigua Cantilever Umbrella in striking Black. Our Antigua Black Cantilever is an extraordinary, versatile piece of outdoor furniture, giving you the ability to define your space, while giving you protection from the elements. Position your Antigua Outdoor Cantilever next to your stunning grade a teak deep seating, make sure you pick matching black Sunbrella® cushions for a dazzling effect that is so stylish your friends will adore coming over to be part of the luxury! Perhaps you are thinking you need extra cover for an outdoor dining set nearby? There is no need when purchasing the Antigua Cantilever Umbrella and moveable Antigua Base, as you can have a full 360 coverage, and move the whole unit if necessary! The style and state of the art design of these magnificent off-set patio umbrellas are what keep them in our best sellers department! Each Antigua boasts a terrific 3 metre squared canopy, elegant powder coated aluminium pole, and moving pedal, which enables the umbrella to do a full rotation. 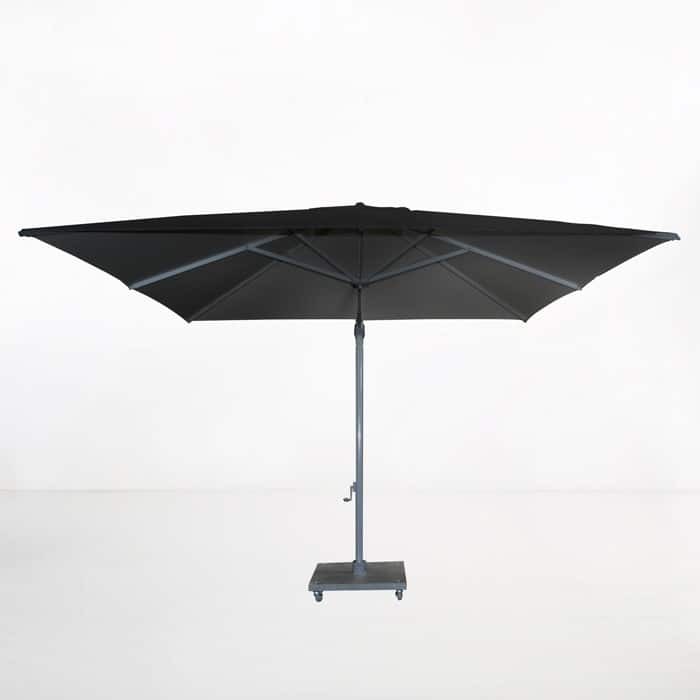 This Antigua Cantilever is the most useful and stylish umbrella yet! If that weren’t all, you’ll be thrilled to learn that the Antigua Aluminium Umbrella is made from top of the range, all weather materials for the outdoors. The powder coated pole is also fitted with #316 stainless steel, which is marine quality – perfect for outdoor use. 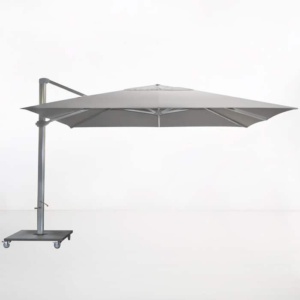 And the canopy is none other than 100% Sunbrella® fabric, which won’t fade, discolour or morph outside. All features that keep your stunning piece of furniture looking in tip top shape! 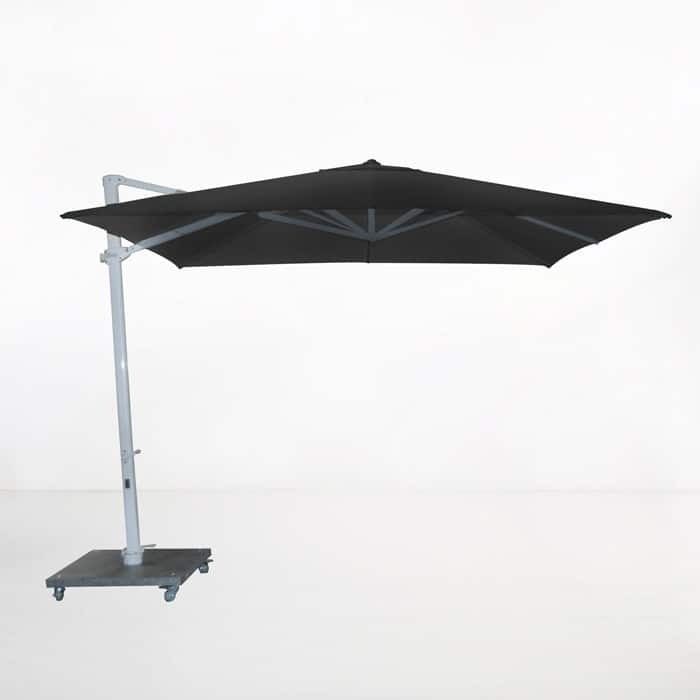 The Antigua 3.0 Metre Cantilever Umbrella range is available in 4 beautiful colours (shown here in black) so you can create a space that is uniquely you! Call us today to learn more about the or any of our other umbrellas, we have many options.